The oreo sandwich cookie, made up of two chocolate wafers with a creme filling in between, is one of the best selling cookies in the United States. They are… often enjoyed with milk. Sometimes made into a dessert. And sometimes even deep fried! 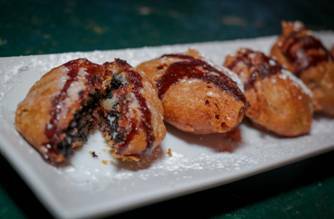 Pictured here are deep fried oreos from NYC’s Bounce Sporting Club. They’ve got cake batter fried oreos topped with warm hot fudge, finished off with a sprinkle of powdered sugar. Grab a cookie and celebrate! Nabisco’s Oreo cookies are suitable for vegetarians and vegans too. Next Story → Happy Pi Day!